Carol's Theatre Reviews ~ It's Fun To Go Out: Globe’s Bittersweet Homage To “Leonard Pelkey”: A Stunning Tour de Force Delivered by James Lecesne. 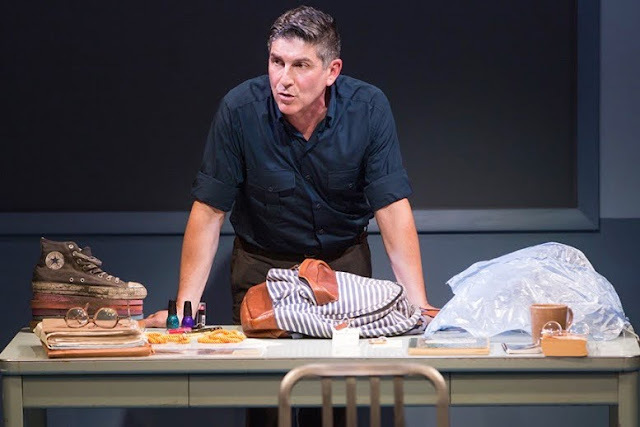 Globe’s Bittersweet Homage To “Leonard Pelkey”: A Stunning Tour de Force Delivered by James Lecesne. Don’t be misled by the words ‘A One Man Show’. There are Solo Performances and solo performances. 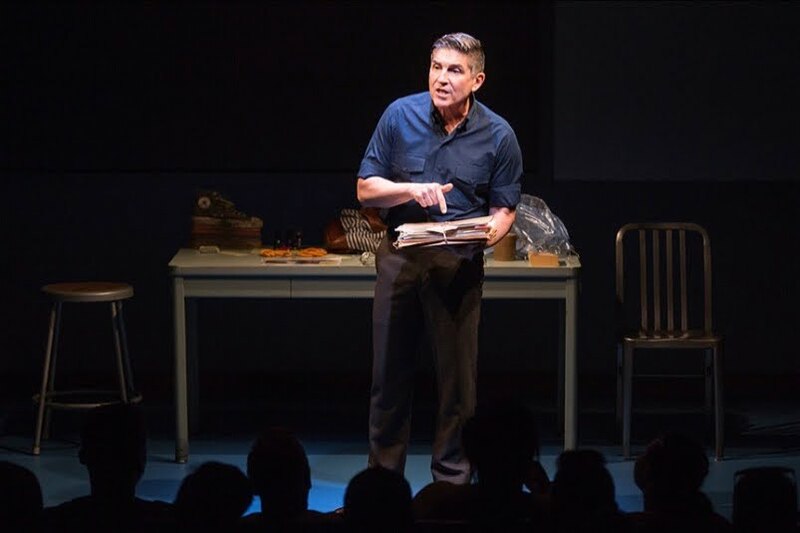 “The Absolute Brightness Of Leonard Pelkey” now in a stunning tour de force by James Lecesne at The Old Globe through Oct. 29th, is a one -man many-character piece. Each one of the characters that stream through Lecesne talks about, to and of Leonard Pelkey and not one is Leonard himself. And that’s the beauty of playwright’s story. We meet and get to know the uniqueness of Leonard by those that did know him. The playwright/performer is most noted for his Academy Award winning short film “Trevor” and his ‘Trevor Project’ that serves as a 24-hour prevention hot line and crisis intervention center for the LGBT community. The play based on his the novel of the same name was published in 2008 and was adapted to a solo show in 2015. “Brightness” is a very well oiled machine. This is not Lecesne’s first time out of the box performance of his moving and bittersweet homage to Leonard Pelkey. “The Absolute Brightness of Leonard Pelkey” opened at the Kirk Douglas Theatre in Los Angeles in 2016. It caught the eye of Globe’s artistic director Barry Edelstein who thought it would be a good fit for the space in The Sheryl and Harvey White Theatre. He was right. The story as told by middle-aged Homicide detective Chuck DeSantis is as spellbinding and somewhat comical, in an off-centered way, as are the characters that fill in the blanks helping to complete the picture of a 14 -year old, missing teen. DeSantis is from New Jersey in ‘some godforsaken precinct down the Jersey shore’. He also quotes Shakespeare and that’s one of his endearing qualities. In everyone’s opinion, Leonard was ‘different’ and exceptional. No it wasn’t just that he dressed flamboyantly or that he wore eye makeup, or nail polish or that he was gay, or that he made a makeshift pair tennis shoes bonding together the bottoms of several pairs of flip-flops in Rainbow colors; it was the fact that he so was comfortable in his own skin, something that confounded his acquaintances and small group of friends. The fact that no one could convince him to tone it down for the sake of his own safety loomed in everyone’s fear of Leonard’s well being. He was being bullied and harassed in school. Ultimately, as we learn at the outset, 14 -year old Leonard, then living with…a sort of relative (he’s her brother’s ex-girlfriend’s son and the mother died) and her daughter, was the victim of a hate crime and it was up to Detective DeSantis to help solve the crime. After being reported missing, his body was found at the bottom of the lake tied to an anchor. With nothing more than a table and chair, small lamp and a coffee cup the evidence is set out on the table—a sneaker, some rope, a money clip, his schoolbag, composition book, glasses, and some incidentals (nail polish and eye makeup) in a zip lock bag and a stack of files about the case (Jo Winiarski), Lecesne makes his way through the unraveling of Leonard’s death. We follow the clues, witness the questioning of the suspect, and attend the funeral, the trial and the surprise ending. Yes, there is one of those as well. With a turn, a change in his voice (and a very pronounced Jersey accent) a subtle stoop in body language, an attitude, gender, a pronounced strut and or a foreign accent he changes like a chameleon from one personality to another with the strengths zeroing in on Ellen Hertle, Leonard’s almost aunt, a hairdresser and her ‘sixteen going on 45’ year old daughter Phoebe, ‘a kid but without innocence’. The two provide the most poignant and heartbreaking clues as to whom Leonard was and how he brushed up against them giving them, and for that matter all that knew him ‘absolute brightness’. If you did not come away from the play feeling the aura of Leonard Pelkey then you missed the point. Two Thumbs up on this short, 80 or so minutes, but profound story.